I very rarely write posts like this but right now it's 1:21am and I am sitting atop my bed crying. I've just found out Lauren Bacall has passed away. Many of you mightn't know who Lauren Bacall is (was) but she has been the definition of the word IDOL for me since I was a young teenager. I must say, it's a very unusual feeling having someone you looked up to so much - yet never knew personally - pass away. I genuinely feel as though a piece of me has gone with her. Only a few days ago I was sitting down to watch a "Bogie and Baby" marathon, singing her praises on social media. Now, just a night after the news of yet another legend, Robin Williams, passing, I am numb to the core. 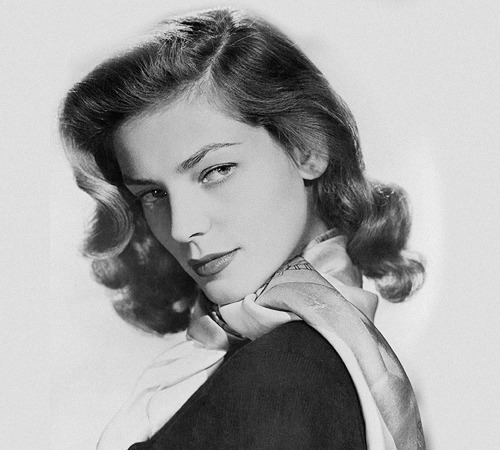 This won't be a post on the history of Lauren Bacall - there's a heap of that information online and in books (particularly her autobiography "By Myself and Then Some") - it's just a tribute of sorts, on why she meant and always will mean so much to me. I started getting into Old Hollywood properly at around the age of 12/ 13 - watching the usual Marilyn Monroe and Audrey Hepburn films at the beginning. I then moved on to the works of Rita Hayworth, Cary Grant, Katherine Hepburn, Gregory Peck, Bette Davis - and Lauren Bacall. My first encounter with Lauren Bacall's films was around 6-7 years ago. My Nana brought me to see 'The Big Sleep' (1946) in the IFI cinema in town. 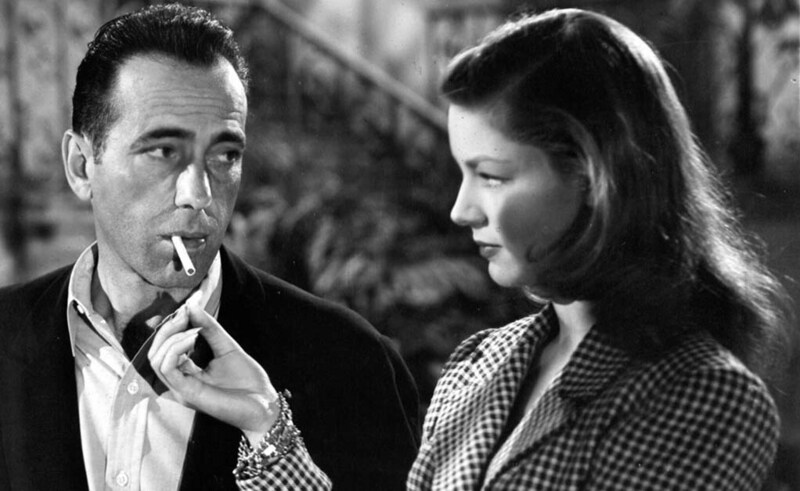 I was dying to see it, as I was a growing fan of Humphrey Bogart and was familiar with Lauren Bacall through the various Old Hollywood books I'd read and websites I followed. Well, I was besotted. It was love at first sight. I remember being sucked into that movie like I was in a trance. I left the screening absolutely head over heels for Lauren and immediately started watching her countless movies, interviews and read everything I could find on her. Over the years, my obsession and adoration for her grew and grew. She was different to the other Old Hollywood starlets of her day; she was boyish, husky, flirty yet bold and sharp as a needle. She had an instant likability on screen. She stood out a mile. Her chemistry with Humphrey Bogart on screen was electric - and their off-camera romance was THE talk of Hollywood at the time. They were a team like no other - 'Key Largo', 'Dark Passage', 'To Have and Have Not' - we are lucky to have such talented legends immortally living behind the camera bouncing one-liners off one another. Old Hollywood has been one of the biggest influences for me growing up and still today. If you've followed my blog and my old Youtube channel over the years, I'm sure you're pretty aware of my love for the 1940's especially. The term "celebrity" is thrown around so much nowadays but back then STARS were the full-package. They sang, they danced, they acted - they were the dream, they were the true stars of Hollywood and unfortunately they have left us one by one - as so life so cruelly takes us all - and Lauren was one of the last to go. Being completely honest, I started writing this blog post in an attempt to cheer myself up as the news has hit me like a tonne of bricks. Surprisingly, it has cheered me up (ever so slightly). I just wanted to give my 2 cents as to why Lauren Bacall means so much to me. She isn't as popular a name as Marilyn, Audrey or Rita but she was just as talented and shone like a star. I knew Lauren was the actress for me from the get-go and watching a film or performance of hers never failed to put a big, goofy smile on my face. It gives me a strange sense of happiness to think she's up there, somewhere or wherever, back with her old love Bogie again. Soulmates. I'm so thankful for my Nana for introducing me to Lauren Bacall and I will be eternally grateful to Lauren for her talent, her honesty, her wit and her intelligence. She will always have a place in my heart. "I’m not ashamed of what I am - of how I pass through this life. What I am has given me the strength to do it. At my lowest ebb I have never contemplated suicide. I value what is here too much. I have a contribution to make. I am not just take up space in this life. I can add something to the lives I touch. I don’t like everything I know about myself, and I’ll never be satisfied, but nobody’s perfect. I’m not sure where the next years will take me - what they will hold - but I’m open to suggestions."